Fancy Treehouse. : Life Goes Easy On Me. Life Goes Easy On Me. I am drunk (wasted!) on instant Netflix. So many cancelled television shows, so many straight to DVD movies! Tis the season to OD on poor quality entertainment! Here are some photos of our daily family walk. It was beyond euphoric. I am embracing the 80 degree weather though I feel like a fool for watching my fireplace DVD. Some people are getting snow right now! I definitely didn't need my trench today, but when has that ever stopped me? Gee, I really love this guy! He's in the only two brands that exist in his world right now, A.P.C. & J.Crew. He told me not to post pictures of him but again, when has that ever stopped me? Vintage crochet blouse, Striped A.P.C. tank top (found it at Crossroads for 7.50), H&M speckled trousers (gift from Mom), J.Crew ankle socks (gift from Gabe), Farylrobin loafers via Gilt, Urban 1972 Floral Trench (gift from Urban 1972), Vintage bag. Have a great night and don't forget to snuggle with the ones you love and tell them how great they are. so cute! and I totally relate to the wonders of netflix... I have spent many an hour watching guilty pleasure shows/movies. Loves it! That crocheted blouse is lovely! oh dear. i've fallen in love with your blog. :) you're darling, your photos are darling, and your style is darling! I was just looking for pictures on socks, and then here's your blog with cute socks galore! Love them! 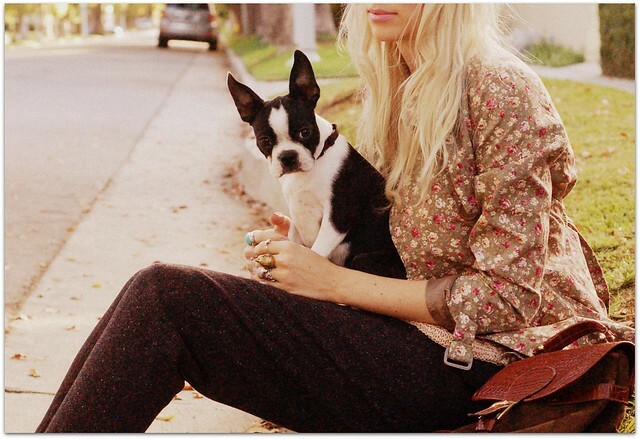 Cute outfit, cute dog, and cute boy! So adorable. I always look forward to your posts. 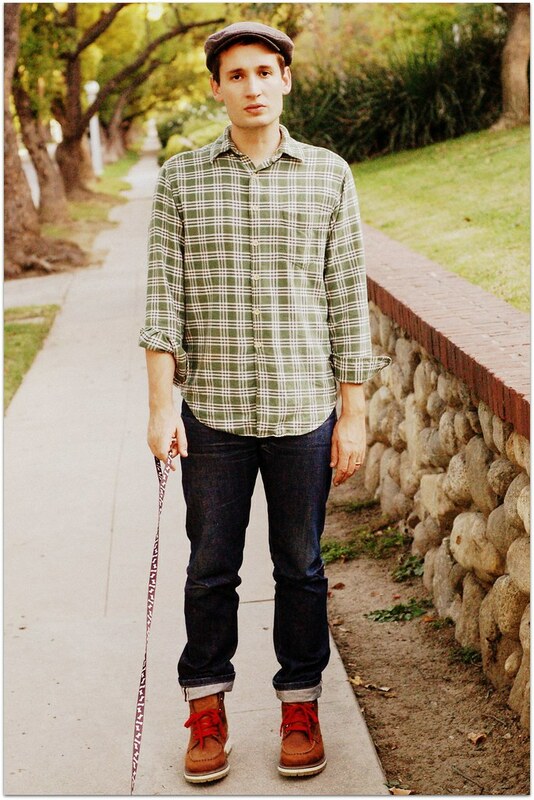 Especially because it usually involves walking your pup, and you looking so cute doing it. I'm on the same netflix boat, most amazing thing ever. I dont think I ever want cable again, what a waste of money! Love the pants and the loose sweater....and the perfect red socks. can you reply in a comment on my blog? Beautiful! And Birdie is such a babe. HEY CUTE BLOG!!!! I LOVE YOUR STYLE!!! Will you check out mine? It's new and i'd love to have you as a follower! I love instant play on netflix. I've been in love with netflix for the six years I've been a member, but over the past near two years, instant play has rocked me! beautiful outfit! 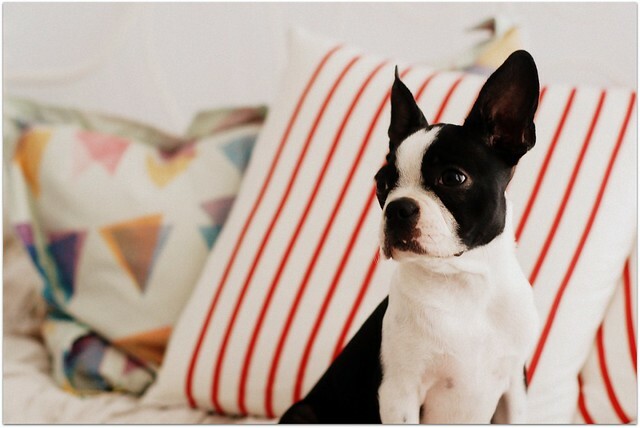 your boston terrier is so cute. I recently found your blog and I absolutely love your style! Your family is adorable!!! The floral trench is so cute! Teehee, does this mean you are a RED SOX fan? your outfits, photos... always so ethereal and amazing! Even if you change the colour of your shoes...I love them! Okay I just stumbled upon your blog and I'm completely smitten!! Your gorgeous and this outfit is incredibly inspiring!! You guys melt my heart! What a sweet memory! Cuteness overload :) Love the touch of the raspberry socks! that trench is DARLING, i absolutely love it. and your dog is too cute for words, i want to squeeze her! I hear ya (on two levels). 1. Netflix streaming is amazing. My husband and I have been wasting ourselves away on the PBS Sherlock Holmes series and other random oddities. 2. I too wish I could bust out my raincoat, but sadly in the Carolinas it's still a high of 70 degrees. P.S. Your outfit is divine. Acabo de descubrir tu blog y ya te sigo,tienes unos looksmuy frescos. me encantan. I'm so glad I discovered your blog, it's lovely :) Your style is so unique and originial, very inspirational.